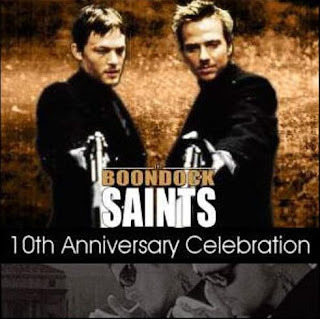 The Boondock Saints 10th Anniversary Event! 2000 was certainly a year to remember; the majority of Americans were still obsessing over the fact the Y2K panic was simply a scare and nothing more, and many were kicking themselves in the behind for wasting so much money stocking up on supplies. We weren’t as knee deep in national or worldwide debt as we are now. Unemployment was down and our economy was up! Yes folks it certainly were better times with hopes and dreams for a bright and shining future ahead of us. But what made 2000 truly a good year was the release of what would become some of the most memorable films of the new decade, including Writer/Director Troy Duffy’s masterpiece; The Boondock Saints. What many didn’t know at the time was that this little known film was to going to become a must see film for movie buffs of the new generation and as well of the coming decade. With such a limited theatrical release and the lack of a major internet community to spread the word around, this film had very little going for it… and yet, it managed to gather a massive worldwide cult following that continues to grow even ’til this day! Now, 10 long years and a sequel later, The Boondock Saints is finally receiving the proper treatment it should have had with it’s 10th Anniversary Event. Centennial, Colo. – February 8, 2010 – Ten years after emerging as a cult sensation, “The Boondock Saints” will return to the big screen in a special one-night presentation, The Boondock Saints 10th Anniversary Event, on Thursday, March 11th at 7:30 p.m. local time. Creator, writer and director Troy Duffy will introduce the event and share rare behind-the-scenes experiences and footage as well as exclusive interviews with cast and crew members including Norman Reedus (Murphy MacManus) and Sean Patrick Flanery (Connor MacManus), captured especially for this anniversary celebration. Audiences will also be treated to special performance clips by The Dirges, Ty Stone and Taylor Duffy whose music is part of the upcoming soundtrack to The Boondock Saints II: All Saints Day, along with a sneak peek into the mobile games, comic books and graphic novel currently in development. Presented by NCM Fathom, The Boondock Saints, LLC, and Hot Topic, tickets for The Boondock Saints 10th Anniversary Event are available at http://www.fathomevents.com/ and presenting theater box offices. For a complete list of theater locations and prices, please visit the web site (theaters and participants are subject to change). Initially released in 2000 as a limited engagement to theaters following the Columbine tragedy, “The Boondock Saints” has gained a tremendous cult following, selling more than seven million DVDs to date. Acclaimed by critics and fans alike, “The Boondock Saints” is a story about fraternal twin brothers Connor & Murphy McManus who embark upon a mission to rid Boston of human evil. After killing two members of the Russian mafia in self-defense, these hard-drinking brothers take the law into their own hands. No public outcry is heard and even FBI agent Paul Smecker begins to feel that the brothers are doing a good deed. “The Boondock Saints” was previously presented by NCM Fathom in 2006 in 130 select theaters. The Boondock Saints 10th Anniversary Event will be shown in 457 select movie theaters including, AMC Entertainment Inc., Celebration! Cinema, Cinemark Holdings, Inc., Clearview Cinemas, Georgia Theatre Co., Goodrich Quality Theaters, Hollywood Theaters, Kerasotes Showplace Theatres, National Amusements and Regal Entertainment Group movie theaters, as well as Arlington Theatre (Santa Barbara, CA), Bainbridge 5 (Seattle, WA), The Carolina (Asheville, NC), Palace Cinema 9 (South Burlington, VT) and Penn Cinema (Lititz, PA), through NCM’s exclusive Digital Broadcast Network – North America’s largest cinema broadcast network. The Boondock Saints II: All Saints Day Blu-ray™ and DVD will be available on March 9. Both the Blu-ray™ and DVD include two commentary tracks with filmmakers & cast, deleted scenes, and two behind-the-scenes featurettes: the making-of documentary “Unprecedented Access: Behind the Scenes” and “Billy Connolly and Troy Duffy: Unedited.” For more information about The Boondock Saints II: All Saints Day Blu-ray™ and DVD, please visit http://www.theboondocksaintsii.com/. NCM operates NCM Media Networks, a leading integrated media company reaching U.S. consumers in movie theaters, online and through mobile technology. The NCM Cinema Network and NCM Fathom present cinema advertising and events across the nation’s largest digital in-theater network, comprised of theaters owned by AMC Entertainment Inc., Cinemark Holdings, Inc. (NYSE: CNK), Regal Entertainment Group (NYSE: RGC) and other leading regional theater circuits. NCM’s theater network covers 171 Designated Market Areas® (49 of the top 50) and includes approximately 16,800 screens (15,400 digital). During 2009, approximately 680 million patrons attended movies shown in theaters currently included in NCM’s network (excluding Consolidated Theatres). The NCM Interactive Network offers 360-degree integrated marketing opportunities in combination with cinema, encompassing over 35 entertainment-related web sites, online widgets and mobile applications. National CineMedia, Inc. (NASDAQ: NCMI) owns a 41.5% interest in and is the managing member of National CineMedia LLC. For more information, visit http://www.ncm.com/ or http://www.fathomevents.com/. Boondock Saints, LLC is the official marketing, promotion and communication arm for all things “Boondock.” The company creates and produces special events for the growing community of Boondock Saints fans worldwide, manages media inquiries and requests for personal appearances and operates three websites, http://www.boondocksaints.com/, http://www.boondockfans.com/ and http://www.boondockstore.com/ to provide the public with a dynamic interactive forum for discussion and user-generated content along with instant access to updated information about the films (The Boondock Saints and The Boondock Saints II: All Saints Day,) related music, merchandise and a variety of other creative developments in progress.